The magic behind "(Sittin' On) The Dock of the Bay"
Redding started to write “(Sittin’ On) The Dock Of The Bay” while he was staying on a houseboat that he’d borrowed from the San Francisco rock promoter Bill Graham while he was playing a week-long stand at Graham’s Fillmore. He only wrote the first verse, the one about watching the ships roll in. Cropper wrote the rest of the lyrics, and he wrote them about Redding. But I think the song resonated the way it did because of reasons that go beyond Redding’s death or the specific conditions that Cropper was writing about. It’s a deeply soul-weary song about moving all the way across the country, trying to change your situation, and just finding yourself completely alone. If anything, it’s only gained in resonance since its release, as people from the younger generations have had to do that more and more often. For a while, I thought there was something messed up about how Redding, arguably the greatest hard-soul rasper of all time, only hit #1 with a song where he abandoned that gospel-grown style and went for a soft and tender croon instead. But that’s the direction that Redding wanted for his new music. He’d had surgery to remove throat polyps shortly before he recorded the song, and he was in the process of changing up his singing style, making it into something more sustainable. And if anything, the understated style he uses on the song is even more expressive than his full-throated howl. On that song, his voice is lithe and ruminative, and it submits to the melody rather than dominating it. Meanwhile, the song itself is full of sharp little musical touches: The humid bassline, the liquid Cropper guitar chimes, the perfectly-timed bursts of horn. It’s a quiet miracle of a song. We can only guess at what might’ve happened if Redding hadn’t died. But if this was the direction he was pushing in, he could’ve just cranked out one masterpiece after another. He’d clearly come to a new understanding of his own unbelievably powerful voice, and he was pushing it in new directions. It’s a genuine tragedy that we never got to hear where he was going with it. But at least we got this song. 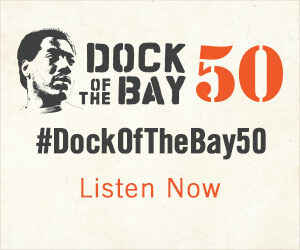 Buy your copy of “(Sittin’ On) The Dock of the Bay” here.